Braxton Walcott, 36, builds housing for employees in the oil and gas industry, primarily in West Texas and New Mexico. He found Central Athlete because it is conveniently located in his neighborhood, just two blocks from his condo in downtown Austin. 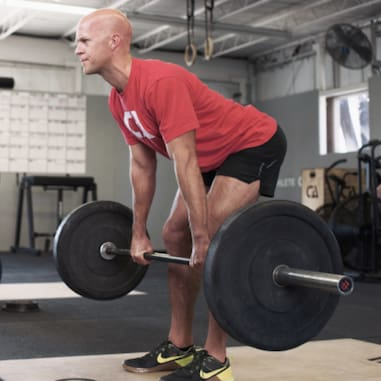 He first took a class at the Crossfit Central gym right next to Central Athlete, then realized he wanted something different. “I was looking for personalized programming instead of classes,” said Braxton, who has been training at CA since March 2016. Below, he talks about his experience. “High school was the first time I actually trained or exercised with a purpose. In those days, it was whatever my coaches planned for us to do that day. In soccer it was usually sprints, in football it was weights and the normal high school conditioning. After high school, I didn’t train again until i was out of college. I started with running a couple miles a day and eventually added dumbbell workouts. A few years later I began training with friends at a gym, and three years ago I hired a traditional trainer that I met with 3 days a week. And then I found Central Athlete. “I’ve experienced timely strength gains, muscle gains, and performance improvements, which were my goals. There are several factors that contributed to this. First, all of my workouts are ready for me on my phone before I enter the gym. Second, Justin provides me with auxiliary movements that contribute to my overall strength. Last, I’m motivated and excited to work out, which has made me push myself harder than ever before. “I like the flexibility to work out when I want but with all the guidance I need to reach my goals. I can always just call or text Justin if I’m traveling, and he is able to adjust my workout schedule, which is great. “Every day is a bit different for me, and the fact that I’m able to work out when it’s convenient for me is essential. It’s like having a personal trainer but without having to commit to a set time—especially now that a coach is on-site to give that extra guidance when needed. It’s the best of both worlds. Having a training program designed just for me keeps me focused and always reaching for my next PR.